AAM Aadmi Party (AAP) workers led by Deputy Chief Minister Manish Sisodia, sat on a protest outside the Election Commission on Friday, alleging “politically motivated and illegal” raids were being conducted on a call centre hired by the party to make people aware that their names had been deleted from voters’ lists. 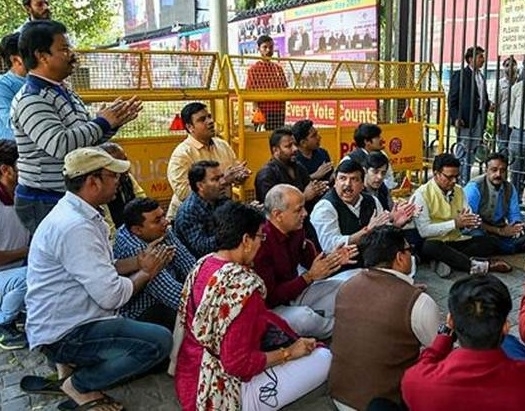 After sitting for over three hours outside the Election Commission in protest, Sisodia and Lok Sabha candidates Atishi and Raghav Chadha were called by the Election Commission to hold a joint meeting with police officials. After the meeting, Sisodia said, “We are responsible for making these calls to tell the public about their vote deletion. Telling people about their rights is not a crime.” Sisodia has alleged that a fourth raid on the call centre, hired by the AAP, was conducted barely an hour after he met Chief Election Commissioner Sunil Arora on Friday. His delegation met the CEC to lodge a complaint against the Delhi police which, he claimed. “After our meeting with the CEC, we were assured that he will look into the matter but within an hour we see that a fourth raid is conducted on the call centre,” he said.